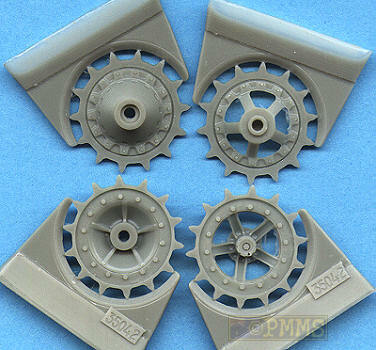 This set of resin individual tracks links from Russian company MasterClub represents the later type track and drive sprockets used on BMP-2s and are fully workable after assembly. There are 190 individual track links, four spare track links and two later style drive sprockets to update the available BMP-2 kits such as those from the older Dragon Modern AFV series. The links are cleanly cast in light grey resin and the only clean-up required is the remnants of the casting block scar on one end of each link which is quickly removed using a sharp #11 blade. Detail on the links is excellent with very crisp and cleanly cast link and end connector detail with very fine casting numbers included on the inside of each link and nicely contoured guide teeth on each link. The two part drive sprockets are also cleanly cast with nice rim bolt detail and as mentioned depict the later simplified sprockets mostly seen on late model Russian BMP-2s. The casting block attachments are quite small making for easy removal with just the odd bit of fine resin flash to clean up between the sprocket ribs and the two halves glue precisely together but make sure you line up the teeth as you go. The tracks in the set are designed to clip together with each link having small attachment pins and corresponding locating holes with assembly being straightforward by slipping one pin in place and using light pressure easy the end connector over the next link to click into place. Assemble is quick and easy but ensure you do not flex the end connector out too far as it may break off but you will soon get into a rhythm and have a track run done in no time. After assembly the track runs articulate freely and fit the resin sprockets without problems as you would expect and to fit the sprockets to the Dragon BMP-2 kits you will need to reduce the sprocket axle pin length by half which is easy enough to do. The Dragon kit road wheels have rim lips that are way to pronounced and the resin track will not fit over the wheels but it is best to use this set in conjunction with the previous MasterClub BMP-2 Late Road wheel set #MC235005 as these wheels fit the tracks perfectly and also improve the look of the kits that much more. 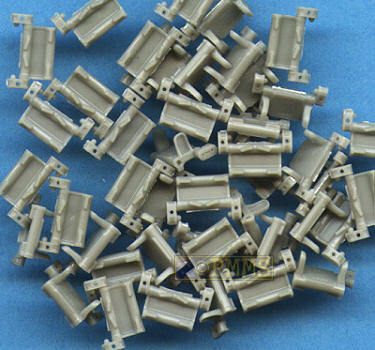 The detail on these links is very good with minimal cleanup and easy assembly although care is needed to not damage the end connectors in the process but overall there are few issues with this set. 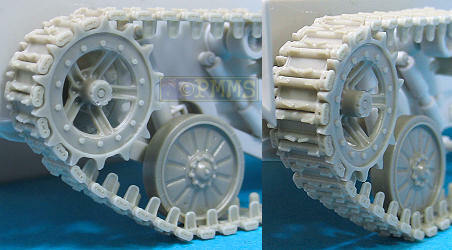 The later style track and drive sprockets will allow you to update the available BMP-2 kits along with the later road wheel set as mentioned and should appeal to Modern armour fans.